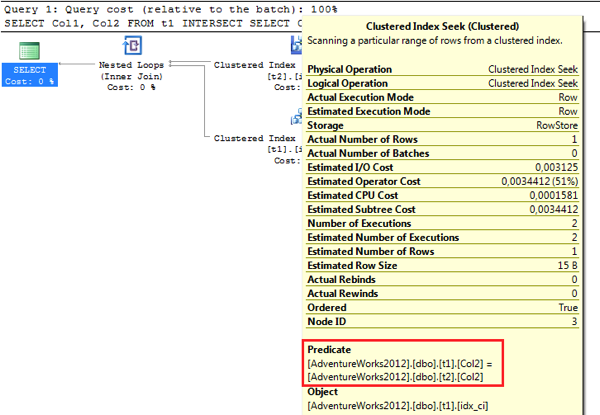 In today’s blog posting I want to talk about the INTERSECT set operation in SQL Server. The INTERSECT set operation intersects two sets with each other and returns the rows that appear with identical column values in both sets. The following picture illustrates this concept. 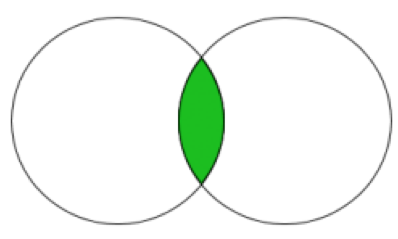 The following picture shows how the result sets differ between INTERSECT and the INNER JOIN approaches. Now let’s analyze the execution plan of the INTERSECT set operation. 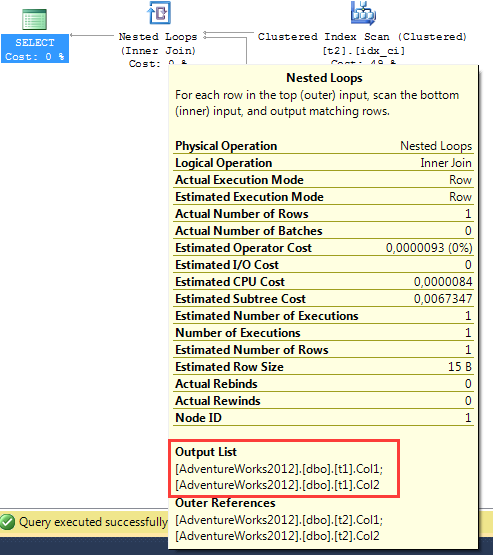 Because you have a supporting index on column Col1, the Query Optimizer is able to translate the INTERSECT operation to a traditional logical INNER JOIN operation. But here the operator Nested Loop (Inner Join) doesn’t really perform an INNER JOIN operation. Let’s see why not. When you look at the inner side of the Nested Loop operator, you can see that you have a residual predicate on the Clustered Index Seek (Clustered) operator. The residual predicate is evaluated on the column Col2, because that column is not part of the navigation structure of the previously created Clustered Index. 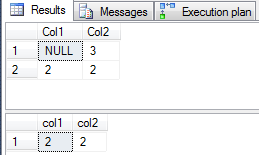 As I have said at the beginning, SQL Server has to find matching rows that have same values in ALL columns in BOTH tables. With the Clustered Index Seek (Clustered) operator and the residual predicate SQL Server just checks if we have a matching record with the same column values in the table t1. And the Nested Loop operator itself just returns the column values from one table – in our case from table t1. 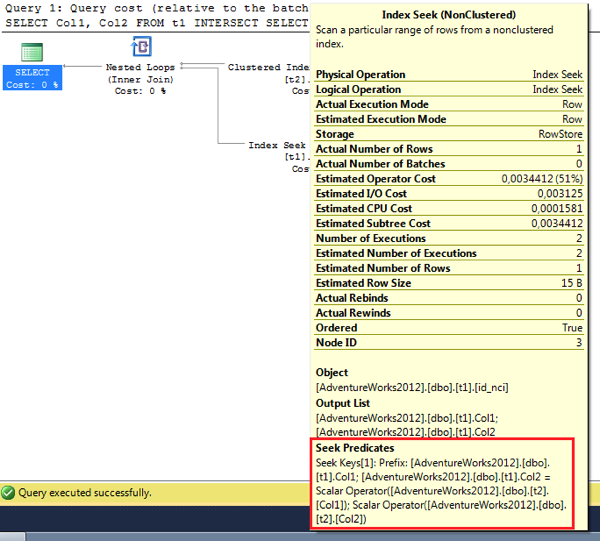 Now when you look again at the execution plan of the INTERSECT operation you can see that SQL Server performs an Index Seek (NonClustered) operation on the previously created index, and that the residual predicate is not needed anymore. When you perform the INTERSECT between both tables again, now you can see a Nested Loop (Left Semi Join) operation in the execution plan. 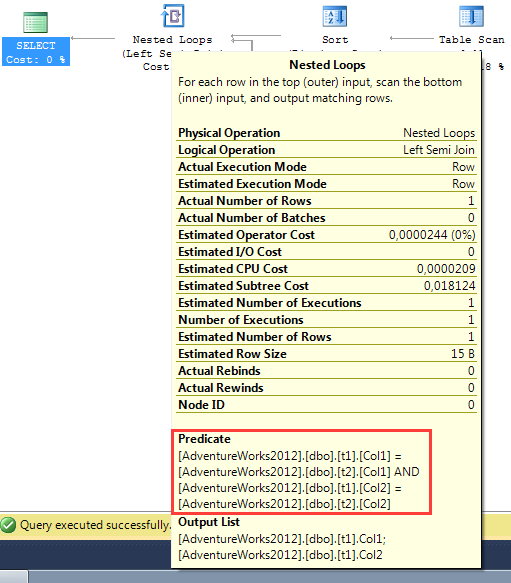 SQL Server now has to perform the Left Semi Join physically in the execution plan by performing a Table Scan operation on the inner side and making a row-by-row comparison with a residual predicate inside the Nested Loop operator. This execution plan isn’t really efficient, because the Table Scan operator on the inner side has to be performed over and over again – for every row that is returned from the outer table. Supporting indexes are very important if we want to perform the INTERSECT set operation as efficiently as possible. The INTERSECT set operation is a really scary one, because almost nobody knows it well. When you use it, you have to be aware of the differences between it and an INNER JOIN. And as you have seen it is also very important to have an efficient indexing strategy, so that the Query Optimizer can generate an execution plan that performs well.